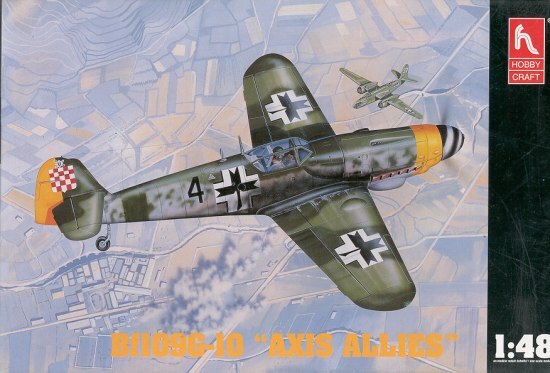 The Bf-109G-10 was an attempt to take all the various modifications and updates to the 109 and put them into a single airframe. Basically, what you ended up with was a 109G with all the 109K upgrades. The thing about the G-10 variant was that none of them were built brand new. Every one of them was rebuilt from an earlier airframe, most of them from Bf-109G-6s. These airframes came in for repair when they were too damaged to be fixed locally. The 109 is one of the most confusing aircraft to pin down as to exact sub-type of any aircraft that I have ever dealt with during the 30 years that I've been building models with any 'serious-ness'. However, it is the confusion and difficulty that makes the 109 such an interesting subject. That and the plethora of different camouflage schemes that it wore. There are three definite traits that the G-10 will have. One is a more aerodynamic cowling. There are two types that the G-10 carried, and they are identified by either a curved section that smooths the aft portion to the airframe or a flat panel that performs this function. It is only visible on the left side. The type 100 is the curved one and the type 110 the flat panel. Most G-10s had the type 100. The second is that they all had the newer 'Erla Haube' canopy. Finally, they all had the new taller fin and rudder. Early G-10s had the same wheels and upper wing wheel bumps of the 109G-6 from which they were rebuilt. Later, they got the wider wheels and wider wheel bumps, though there were still the others being produced. Some also had shorter tail wheels as found on the majority of 109Gs, while others had the taller tail wheel found on the K and some G-6s and G-14s. It would not be unusual to find the shorter tail wheel and the wider wheels or taller tail wheel and narrower wheels. The key is research. Unfortunately, the wheel sizes and their corresponding wing clearance bumps are not always visible in reference photos so it is at time a crap shoot. Hobbycraft has often been much maligned for its kits. OK, they are not cutting edge, but they were not designed to be so. They are less expensive than other similar kits, easier to build and still produce a very nice model when finished. Hobbycraft was also taken to task for their horrible decals and less than informative instruction sheets. Those are a thing of the past as this kit has an excellent decal sheet and the instructions contain all the info you need, with the exception of interior and detail color information. I'm not sure just why this info in omitted, but it is. However, I can tell you that the interior is RLM 66 and the wheel wells, gear doors, and gear struts are either RLM 02 or the underside color. There are optional parts for the wider wheels and wing wheel fairings as well as the different tail struts. The cowling is definitely the type 100 with the curved section on the left. While the wing, landing gear and interior bits are all the same as what is with any of the G kits, the fuselage half sprue includes the newer fuselage, wider wheels and wider prop. It also includes the gear doors as found on the K. If you want to build this kit as a K, it would be an easy enough task, though you'd need aftermarket decals. The radio access door is in the K position and needs to be filled in. A replacement is provided as a decal and should be installed one frame aft and lower. The kit also does not include the little 'box' in the back of the cockpit for clearance of the MW 50 system that most G-10s carried. It is shown on the box art and is easy enough to make, but it should have been included. The kit rudder includes the additional trim tabs. These can be sanded off if the model you are making doesn't have them. Reports on earlier boxings of this kit state that the horizontal stab holes were not properly aligned with each other. I can't confirm that on this kit but will be able to tell once it is being built. Overall detail for the kit is really quite good. Externally it is fine engraved lines with nice, sharp edges, while the interior bits are also well done. Not as petite as in Hasegawa kits, but more than adequate for the majority of modelers. As always, there are aftermarket interiors and other bits available should you want to add them in. Instructions are quite good and acknowledge that there were some fit problems with a few pieces, so notes that they need to be filed down a bit are included. You also will find that you need to drill some holes depending on which optional parts you wish to use. Notes are present to assist with proper installation of the various bits and the angle of the landing gear and antennas are shown to help out. The kit has a separate canopy and windscreen if you wish to display it open. The clear parts are a bit on the thick side, but a major improvement over their earlier kits. 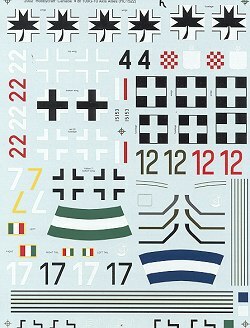 Markings are on a very large decal sheet and provided for five aircraft. First is the box art aircraft from Croatia in 1945. It is in RLM 82/83/76 with yellow rudder and nose band. I have to say that 82/83 uppers were unusual, but as with all things Luftwaffe, not improbable. Next is Red 22, from an undisclosed unit, though it is probably JG 52 or JG 54. It also has a yellow rudder and nose band, but is painted in the more likely RLM 81/82/76. The next is for two aircraft, each apparently Yellow 7. One is from JG 54 and the other JG 300. Both are given as RLM 82/83/76 with the only difference being the Reich Defense band on the aft fuselage. From the ANR is this next G-10, Black 17, also shown in RLM 82/83/76. Finally a Hungarian plane in RLM 75/82/76 with a yellow nose band. Two different colors for the code letters are given as there is some confusion as to the proper shade. A very nice touch is that canopy frames are provided as decals so you can use them instead of masking the canopy. Swastikas are provided in a two-piece deal to keep from upsetting the squeamish. What is not given in the markings guide is any indication of which tail wheel or main wheels should be used. I seriously doubt if ALL of them are the same as shown on the box art and personally am not too sure that the plane shown had the small wheel clearance bumps on the wing. This is something else that Hobbycraft needs to work on. I highly recommend doing some research on the aircraft you are modeling if using the kit decals. The decals themselves look just great and should work as well as any aftermarket ones. I've used HC kit decals and the newer ones are just superb. This sheet is dated 2002. Personally, I don't know how you could go wrong with this kit unless you are super fastidious or only build for competitions. It is reasonably priced, rather well detailed for your bucks and offers several interesting schemes. It will also provide some spare parts for future projects. It is one I can recommend to all. If you would like your product reviewed fairly and quickly by a site that has nearly 200,000 visitors a month, please contact me or see other details in the Note to Contributors.